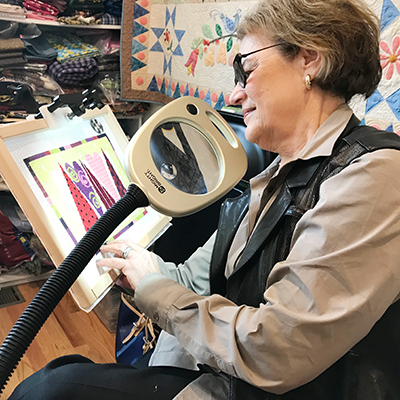 Highly popular Needlepoint School @ Knit One Quilt Too is a great way to get help with a needlepoint project. You might be looking for suggestions on threads or stitches for a painted canvas, have an older project you are trying to finish, or want to tackle the challenges of a counted piece. Perhaps it is a very recent project you’d like to devote more time to with stitches to enhance and embellish. Needlepoint can be traditional but has also evolved into a true three-dimensional art form. Relax and stitch with no distractions. Take advantage of the beautiful classroom along with the instructor’s deep knowledge and experience to move you further toward the completion of your project. This class is suitable for all students, beginning through advanced. Students will bring own canvas of choice, usual stitching supplies. The instructor will supply some craft lamps, magnifiers, and always has needles and other tools. Individual consultation with Caryl prior to class start. Please call Caryl at (401) 524-4615 or the shop at (401) 337-5578 to register. A $50 non-refundable deposit is required by February 19. The balance is due on the first class, March 5. These classes fill up quickly; consider registering early to avoid disappointment. You can mail your deposit to Caryl Freedman, 70 Martingale Drive, Warwick, RI 02886. Plan ahead! The anticipated 8-week summer semester begins Tuesday, May 21.